20120421 - Up and JG&I made final preparations and headed out leaving L at home for a day of shopping and an evening with Barry Manilo. 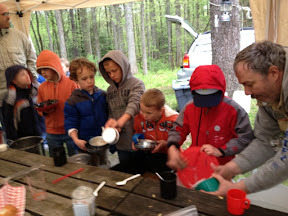 The boys and I got gas, stopped at mcD's for bfast and then headed south through the rain to Hocking Hills to meet the Cub Scouts. 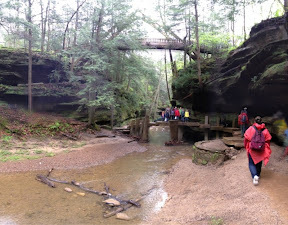 Our first adventure was a hike at Old Mans Cave. 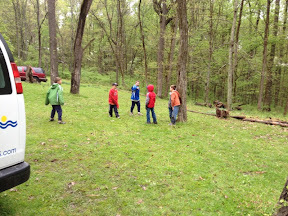 We then made our way back to the camp site where we got our tent up, fire started, wood gathered, scavenger hunt and playing underway! 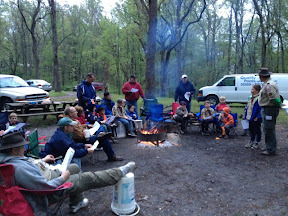 The rain did eventually stop and we got dinner, everything cleaned up and the evening campfire program rolling. and there was singing and corny skits and jokes. 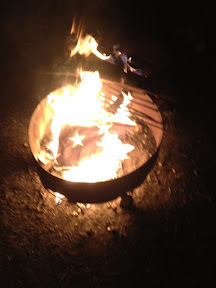 At the end we had a very solemn flag retirement ceremony where we burned a tattered and torn American Flag. 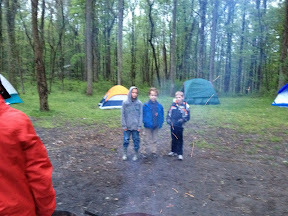 All boys to bed. Up late chatting by the fire.